I've seen movies where the two main characters have been friends since they met on their first day of school. In my mind, it's two girls. One of them is shy and slightly bookish, the other, precocious with a love of adventure-you know who I'm talking about. They've seen each other through parent's divorces, pet's dying, boy's crushing their dreams, dreams being built back up, yadda yadda yadda, you know the drill. The point being, I always get a twinge of jealousy when I watch those movies. I don't have a friend like that. One that I've known for my entire life that I'm still that close with. I have made amazing friends later in life, but no one has been there from the beginning. It's when this thought runs through my brain that I kind of frown at myself and think, "Hellooo! You've got a sister!" 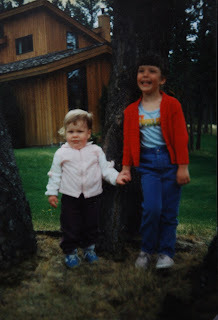 Now, I could tell you stories from my childhood, concerning interactions between my sister, Shannelle, and I, that would be embarrassing for all involved, so I'll refrain from full disclosure. However, I do want to share one story that I bring up as often as I can. Our exact ages are slightly fuzzy in my memory, but my best guess would be that she was 10 and I was 7. The long and short of it is that Shannelle(with the assistance of a friend) convinced me, her younger, innocent, sister to go down the laundry chute. You may ask, why on earth would you vol untary go down a laundry chute? The answer is simple-candy. They bribed me with candy. Candy that, once I went down the laundry chute, had conveniently already been eaten. So my 7 year old self had risked life and limb, ducked past the exposed pipes underneath the sink(where the laundry chute was) and I didn't even get candy out of the deal. Understandably, I was distraught. I had been conned. But as I look over my life with Shannelle I see, and my parents tell us, that this was not the only occasion that Shannelle convinced me to do something I didn't particularly want to do. To this day, I am convinced that some family friends of ours think I am some sort of muffin addict. I would get an extra muffin for myself and for Shannelle because she didn't want them to think she was a pig(she was obviously okay with them thinking I was a pig). The stories could continue. The truth is, I think I would have gone down that laundry chute without the promise of sugary treats at the end. I didn't have to get her that extra muffin and I didn't have to lend her my brand new Mickey Mouse sweater(I had to mention it Shannelle). I did it because she's my sister. We've seen each other through scary Santa visits, muffin crises, moving away from friends, grandparents dying, insincere fights and the fights we really meant. She's the friend who knows it all; was there for it all. The morning my nephew was born, I remember this anxiety in my heart. I was excited to meet him, of course, but it was something else. It was days, maybe weeks later when I finally realized what I had been experiencing. It was this strange combination of pride and helplessness. I was so proud of her for doing the incredibly amazing thing of giving birth. At the same time, I was acutely aware of the fact that by doing this amazing feat, she had to go through extreme pain. Pain that I could nothing about. She had to go through it and I had to sit on the sidelines and hope she'd be okay. 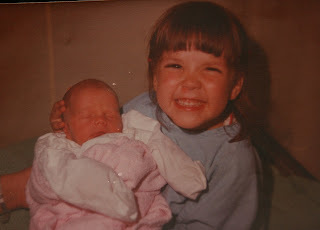 There are few times in our present relationship that I feel like the little, helpless sister. Most of the time, it feels like we're on equal ground. But there are times when Shannelle shows incredible bravery through painful circumstances and I get that anxiety in my heart. And although I know she's got to get through it somewhat on her own, all I want to do is get her an extra muffin and make it okay. i don't really have all the right words to convey how much this means to me... how much YOU mean to me... all i'll say is... i love you. 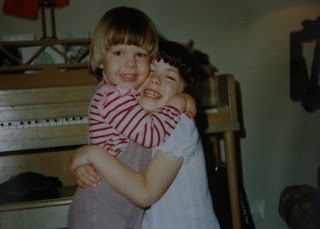 you are the best sister (and friend) i could have ever asked for. This is a truly beautiful post. You are a great writer and you make us miss our sisters!